← Is Sajid Khan the worst director in India? Something is rotten in the state two countries call their own. Not that we’ve really let that show on screen. Hindi cinema hasn’t looked into Kashmir, preferring to gaze at it instead. Haider changes all that, with filmmaker Vishal Bhardwaj probing into the valley nimbly and incisively — we may, at this point, picture the director as a particularly poetic insurgent, wearing Shakespeare for a cloak. This is not a simple adaptation, this takes not a simplistic stance; Haider is a remarkable achievement and one of the most powerful political films we’ve ever made, a bonafide masterpiece that throbs with intensity and purpose. It is a staggeringly clever take on Hamlet, one whose departures from the Bard’s original are as thrilling as its closely-hewn loyalty. The film is set in 1995, with Kashmir in the murkiest of limbos, at a time when it’s anybody’s guess whether any man wearing a long, all-shrouding phiran is hiding either a pot of hot coals or a hand-grenade. 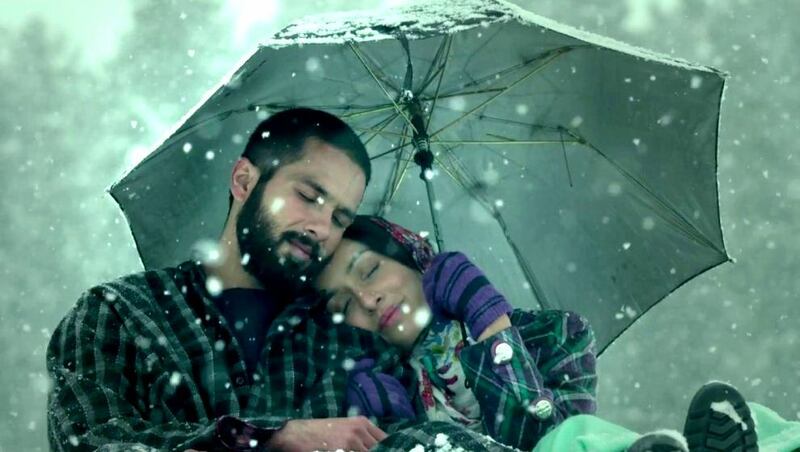 Haider — in case you haven’t guessed — is the kind of film that carries both. The Hamlet here is Haider, a poetry student returning to Kashmir, summoned by the destruction of the family house and the disappearance of his father. He finds his ‘half-widowed’ mother, Ghazala, laughing dazzlingly by the sunlight and his uncle, Khurram, dancing. He is disgusted, depressed, and desperate for an answer, for a way forward. And, on one not-so farfetched afternoon given the state he’s in, a mysterious man appears to replace his loathing with fury — to arm a clueless, restless young man with murderous intent. The allegories are elegantly drawn and exquisitely sharp, like bejewelled daggers. The film is written by Bhardwaj and acclaimed journalist (and former Rediff writer) Basharrat Peer, and it is bold for many reasons. The two stunning Shakespeare adaptations Bhardwaj made before this stayed close to the structure of the originals: Maqbool whimsically played fast-and-loose with characterisations but managed to wrap a crime-boss film neatly around the Scottish play; Omkara stayed so ingenuously loyal to Othello that it even translated lines of dialogue and had pacing similar to the play, but left out the monologues. Haider, while leaving in the crucial monologues, makes audacious changes to the film — for example, the play’s plot only kicks in when the ghost (or the man with the ghost IDs, more accurately) appears, around the midway mark — and several key moments deviate dramatically from the original. These are not subtle changes but these shifts are what make Haider a truly ambitious film. It bludgeons away from the original because, just like the world it is set in, harsh changes are called for. A young man finds himself fatherless — de-fathered by the machinery of the state, in fact — and tormented by local demons, terrorists and politicians. In Kashmir, this saga of disappearance and drama, of uncertainty and unrest, cannot be the tale of one prince or one exalted family; in Kashmir, where mothers know the name ‘Kalashnikov’ all too well, there are too many Hamlets. The detailing is a marvel. Characters speak with, as Robert Plant would say “tongues of lilting grace,” in that delightful, characteristically Kashmiri way of hardboiled consonants and fluid vowels. A doctor’s coat is chequered, just like the local phirans and jackets, chairs and beds are ornately whittled into works of art we can sit on, and the bedsheets are beautiful, chain-stitched wonders. The authenticity is constant, and cinematographer Pankaj Kumar captures detail without lingering gratuitously on it, preferring instead to shoot from the characters’ un-touristy eyes or — better still — to eavesdrop close to them, hovering too-close with brilliant, hand-held unpredictability. We see the distractingly attractive world around them, sure, but the narrative stays grim and, thus hand-in-hand, Kumar’s composition centres on things so close you can touch — the smoke rising from a cup of kahwa in the cold, an accusingly large dot of mehndi on the back of a hand, letters handed out by the postman in plastic packets as if he were delivering cold cuts. This is a film you could watch with the sound muted. But you shouldn’t. Oh no. The music is gorgeous, underscoring the narrative perfectly. (The gravedigger song is my favourite.) Yet while we’re used to Bhardwaj the director making way for Bhardwaj the composer (and, when we’re luckiest, Bhardwaj the singer), the Haider soundtrack knows its place and is allowed no room to showboat. The grim narrative carries strong political heft, and so assured is Bhardwaj of what he’s saying and the way it needs to be said that he doesn’t seem to feel the temptation to sugarcoat, to entertain with either song or wink. The film stays intense throughout, almost breathlessly so. Like a chokehold from someone you love. The performances are uniformly stunning. Shahid Kapoor, dealing with one of Shakespeare’s most challenging heroes, does so with impressive sincerity. He manages the many shifts of mood skilfully but always appears like an actor performing a role gamely instead of an actor who has become the character: he’s very good, just not as unaffected as the actors around him. An actor called Narendra Jha who plays a doctor is an absolute find, Lalit Parimoo is excellent, Shraddha Kapoor is very believable in the Ophelia part, two Salman Khan fans (Sumit Kaul and Rajat Bhagat) are a lot of fun, and it’s good to see Kulbhushan Kharbanda get well-forged lines of dialogue. At the heart of the film stands Tabu. Her Ghazala is a heartbreaking character, all passion and preening and perpetually inappropriate relationships. She looks luminous the first time we see her, but the great actress can amazingly adjust that candle-wick lighting up her face, so not just does she shine and simmer, but she can flicker. The way she looks into the mirror while her son kisses her… It’s haunting. Old Bhardwaj alumnus and former Macbeth Irrfan Khan, meanwhile, is striking in a very clever role that both shows off his screen-presence and kicks the film into a different gear. The best performance comes from Kay Kay Menon in the Claudius role. His Khurram is a slimeball aching to be accepted as a success, an unctuous man and yet one who likes to strut, who likes to revel in his victories — but who, at the singular point of triumph — can only find a fellow conspirator to embrace. This is a traditionally meaty part, immortalised by Derek Jacobi in the 1996 Hamlet, but Kay Kay gives the character his own terrific edge, twitchy and tentative and surprisingly warm. One particularly unforgettable moment in the film features Peer himself in a cameo as a man afraid to cross the threshold into his own house. That particular scene, and its subsequent, immediate resolution, comes from a short-story by Kashmiri writer Akhtar Mohiuddin. It is a great story of such frightening clarity that most filmmakers would have milked it into a longer scene, if not a short-film. Bhardwaj, now more than ever, seems assured of the power of his content, and knows when to pull his punches and doesn’t fall for obvious temptations. The result is a knockout, a film that makes you smell corpses, that makes you shudder with melancholia, and a film that points accusing fingers. A film that doesn’t flinch. Narendra Jha was found in the TV series Shanti eons ago, re appeared in Mahadev and itsy bitsy roles in bollywood… He is not a new find! Narendra Jha was earlier selected for ABCL films in early 90s (hope you guys remember ABCL: Amitabh Bacchan Flop Co.) Later he acted in many a tele-serials and remain fcussed. Kudos Vishal for giving him a chance to prove himself. He is my Maternal Uncle (Mama) and i am proud of him. My take on Haider…Kashmir 1995 is not likely to generate any kind of patriotic nostalgia, on the contrary, it is a gruesome reminder of the excesses committed by armed forces to crush the not so peaceful movement to secede from mainland. Basharat Peer’s celebrated work ‘Curfewed nights’ is a graphic description of Kashmir tragedy with its political and human dimensions. Inexhaustible list of missing persons leaves a pall of gloom and suffering for their families and society in general. It multiplied disaffection with the Indian states and leaves a wide margin for its adversaries. Basharat Peer’s adaptation of Shakespearean play Hamlet in the backdrop of Kashmir created a unique cinema which conducts vivisection of 1995 turmoil torn valley. The adaptation is loose and good for the near real portrayal of events. Vishal Bhardwaj’s symbolism is rich and multilayered. Haider, the eponymous protagonist, is a week vulnerable, susceptible and uncertain link with mainland. He is evolving under the shadow of terrified atmosphere created by gun toting separatists and armed forces. His mother played by Tabu is an apt metaphor for Kashmir painfully maintaining her relationship with her husband who provide succour to the physical injuries sustained by Kashmiris during their struggle to assert their existence. Haider’s mother romantic fling with her husband’s younger brother- Khurram is representative of opportunistic class in trouble torn Kashmir. The excessive focus on the oedipal dimension of Haider’s relationship with Gazala (his mother) by native and foreign media an absolute misreading of subcontinental culture and family norms. Native media is trying to reinvent in global avatar riding on the ghost of Sigmund Freud. Rosencrantz and Guildenstern of the Shakespearean play are convincingly played by Salman’s fans treacherously spying on the protagonist. Irrfan Khan replaces the supernatural element of the play and is one of the finest character creation by Vishal Bhardwaj. Death of Haider’s beloved symbolizes the partial success of the inimical forces to the interest of the people of the valley. The grave diggers exhuming the skull (Yorick in original play) and handing it to Haider is a direct adaptation from the play but here narration steps in to put the stamp of the panchtatva-the subcontinental philosophy about life and death in no uncertain terms. The denouement comes with the self annihilation of Haider’s mother- the metaphor for Kashmir and Kashmiriyat with the message to liberate Kashmir from the cycle of revenge and violence. Vishal Bhardwaj has captured the topography and culture of the valley at a very nuanced level which no other director has done so far. With Haider, indian cinema has come of age and movie is going to be a milestone in the annals of the history of Indian cinema! Sometimes, I enjoy the movie more after reading your reviews. Very well captured. Thank you for continuing to give us your writing and your view of cinema. Sometimes, I enjoy the movie more after reading your review. Very well captured and expressed. Thank you for continuing to share your view and writing with us. Haider is a bold film, an important film. Bold because of its incestuous overtones and important because it brought the issue of Kashmir and AFSPA to mainstream conscious. But a great film, it is not. I’m a huge fan of Vishal Bhadrwaj the composer and a great admirer of Vishal Bhardwaj the writer-director. I was enamored by the characters in Kaminey, stunned by the craft in Omkara, awestruck by the casting in Maqbool. If anything, I wanted Haider to be a great film. By the time I watched the film on the third day, thanks to the electrifying buzz around the film, the extremely rave reviews and the very flattering comments in social media, I was sure I was going in for a treat. Also probably because the trailer was extremely well cut and the music was brilliant, though music is, expectedly, addictive in every Bhardwaj enterprise. The only skepticism I had before walking in was if Pankaj Kapur would be able to do justice to the material at hand like Tassaduq Hussain so wonderfully did in Omkara. To digress a bit, as much as Omkara was lauded for its writing and cast, it couldn’t have been so captivating if not for Hussain’s camerawork. As far as I know, no one else brought out the texture and feel of that area as well since Ashok Mehta did in Bandit Queen. As far as I have been able to comprehend, the huge critical acclaim that Haider gathered was more because of what it was about than how it went about its business. This film was a disappointment but still, in Bhardwaj we trust.